Plant yourself in the perfect career! 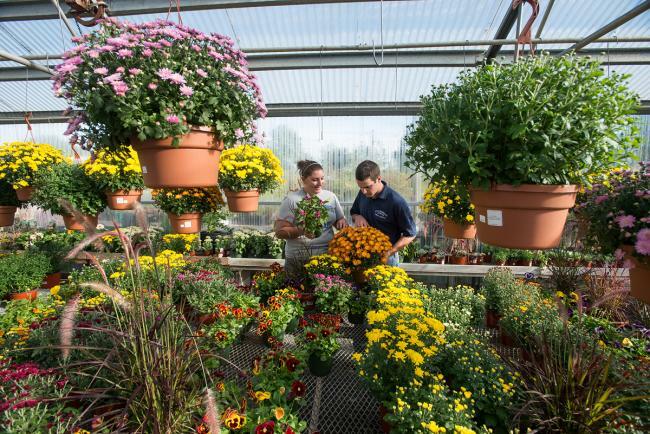 If you are interested in greenhouse management or growing bedding plants, potted plants, perennial flowers, woody plant production or nursery and garden center management then the Sustainable Horticulture major at the Stockbridge School of Agriculture is where you want to be. Sustainable Horticulture students design their own focus of study by electing courses in a range of horticulture topics. Why choose a career in horticulture? Horticulture is the science and art of growing flowers, ornamental plants, fruits, and vegetables. If you like the idea of combining art and science, enjoy working with plants and people, or wish to beautify the environment, then a career in horticulture would be very satisfying to you. As in other areas of the green industry, jobs in various aspects of horticulture continue to increase, and the number of available jobs continues to exceed the number of graduates. Employment positions include growers, sales representatives, garden center managers, and floral designers. Greenhouse and horticulture companies throughout the country offer attractive salary and benefit packages to well-trained professionals. Garden clubs, professional organizations, and horticulture societies provide scholarships to students who are interested in the study of horticulture.